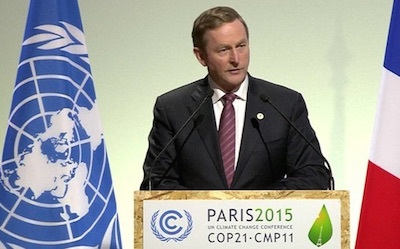 On Monday, at the most important climate talks of the decade, Enda Kenny had the opportunity to make us proud. He could have addressed the world as a climate leader but instead he pleaded for Ireland to be let off the hook. He promised on one hand that Ireland is “determined to play its part” while in off script remarks to journalists, he said “climate change is not our priority”. Not only that, he described our current emission reduction targets as “unrealistic” and “unreachable”. Climate change is the biggest threat humanity is facing. While world leaders are finally getting their act together to tackle this threat, Enda Kenny wants Ireland to get special treatment and be let off the hook on meeting targets on reducing emissions. He’s chosen to side with powerful business interests in the farming and agriculture sector instead of being a leader that wants to protect people and the planet. Ireland is the 8th highest polluter amongst developed countries - higher than China or India. In Europe we are the 4th highest polluter. That’s why we need as many of us as possible to speak out now. Together we can fill the leadership void left behind by Enda Kenny and make sure that Ireland’s on the right side of history when it comes to climate change. If thousands of us sign a petition, we can demonstrate that we’re willing to rise to the challenge of our generation, even when he isn’t. Uplift is teaming up with Friends of the Earth and Trocaire to make sure that Enda Kenny is left in no doubt that he doesn’t speak for hundreds of thousands of Irish people when he says climate change is not a priority. Can you add your name to this petition calling on Enda Kenny to set ambitious targets to reduce dangerous carbon emissions? Climate change is the biggest threat humanity is facing. Your comments that ‘climate change is not a priority’ for Ireland at COP21 are offensive and irresponsible. As the 4th highest polluter per person in the EU, we call on you to set ambitious targets to reduce carbon emissions.